This article covers Cell phone radiation basics and its effects on human health.It mentions how to reduce cell phone radiation. These are the best ways for cell phone radiation protection. The device which helps to make and receive calls over radio link is known as cell phone or mobile phone. This is possible due to availability of different wireless technologies based cellular network viz. 2G, 3G, 4G etc. There are three major components in a cell phone which includes transmitter, receiver and antenna. The transmitter takes voice as input and converts the same into radio frequency output to interface with cellular base station. The receiver part receives the cellular transmissions and decodes the same to retrieve the voice or data or messages. Cellular towers are deployed through out the city to provide cellular service. Each of these towers radiate frequencies with certain power. Cell phone also need to transmit signal with certain amount of power based on its distance from the base station. The cell phone transmissions can be categorized into transmissions towards base station, transmissions towards human body (mainly face and brain) and transmissions in the direction other than base station. Cell phones emit RF (Radio Frequency) signals in the form of electro-magnetic radiation. The EM waves composed of E field and H field moving at speed of light. Hence EM radiation has effects on the human and environment. Following section mentions most common effects of the cell phone radiation and complaints from the human beings. 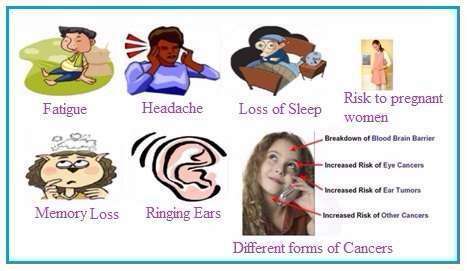 The most common effects of cell phone radiation to human beings are as follows. • creates joint pain, muscle spasms, tremors . • Different types of cancers etc. The common effects of cell phone radiation to the environment are as follows. • Effect on farm animals e.g. cows reduce the milk output due to continuous radiation for more period of time. • EM radiation from towers and cell phones lead to diseases in plants, animals, insects and birds. This is the reason for vanishing of sparrows, bees, butterflies etc. Following steps are followed in order to reduce cell phone radiation. These are the best ways to protect one self from cell phone radiation effects. ➨Make use of speakerphone or earphone or headphone. This will keep the cell phone away from you. ➨Use text message apps (e.g. WhatsApp, SnapChat, SMS, MMS etc. ) for conversation rather than talking. This will minimize the cell phone radiation. ➨Use cell phone to make voice calls when it has good amount of charge on it. This is due to the fact that cell phone radiation is high when phone has less charge in the battery. ➨Do not talk while driving unless it is essential. This will increase chances of radiation exposure due to frequent contacts of cell phone with mobile base station towers (due to handover). ➨Make use of low radiation emitting cell phones. ➨Don't put cell phone to ear during call initialization phase. Use speaker phone at this time. Once the end user picks up the call then only put the phone to your ear. Do this, unless you have private communication to be made otherwise continue using speaker phone. ➨Talk less so that you will be exposed to less radiation and will have good health. Have personal meetings instead. ➨Keep the cell hone away from you during the time of sleeping. ➨Use some forms of radiation protection mechanism such as EM field protector or cell phone radiation shield protector etc.